This Royal Humane Society gold medal presented to the Victorian heroine Grace Darling is estimated at £40,000-60,000 at Morton & Eden in London on November 29. 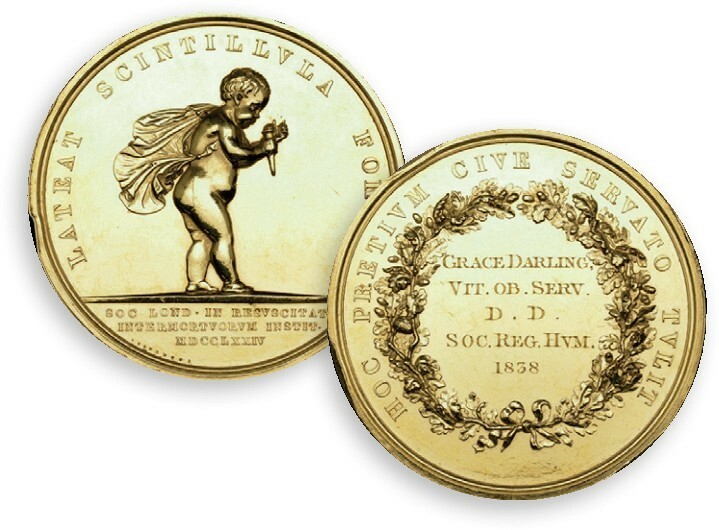 This Royal Humane Society gold medal was presented to the Victorian heroine Grace Darling. It was the first time the medal was awarded to a civilian for a specific act of life-saving at sea, and the first official British gallantry medal awarded to a female recipient. Darling famously assisted her father in saving the lives of nine people during the wreck of the SS Forfarshire on Big Harcar Rock, close to the Farne Islands off the coast of Northumberland on September 7, 1838. She was 23 at the time. Such was her fame, Queen Victoria herself sent Darling a personal gift of £50 in admiration of her heroic conduct at sea, and The Times newspaper made the statement that her actions formed “an instance of heroism on the part of a female unequalled perhaps, and certainly not surpassed, by any on record”. The gold medal and other related gifts and awards will be offered for sale at Morton & Eden in London on November 29, guided at £40,000-60,000.